A new study published online today by Pediatrics and conducted by the Center for Injury Research and Policy and the Central Ohio Poison Center at Nationwide Children's Hospital found that there were more than 8,200 calls to US poison centers regarding exposures to liquid nicotine and e-cigarettes among children younger than 6 years of age from January 2012 through April 2017, averaging 129 calls each month or more than 4 a day. Children younger than 3 years accounted for most (84%) exposures, and ingestion was the most common (93%) way children were exposed to liquid nicotine. More than one-third of exposed children were treated/evaluated and released, while 1.4% were admitted to the hospital. A quarter of children exposed to liquid nicotine experienced one or more related clinical effects. Severe clinical effects were rare, and included coma, seizure, respiratory arrest, and cardiac arrest. "These exposures are concerning because a very small amount of concentrated nicotine solution could easily deliver a lethal dose to a young child," said Henry Spiller, MS, D.ABAT, study author, and director of the Central Ohio Poison Center. 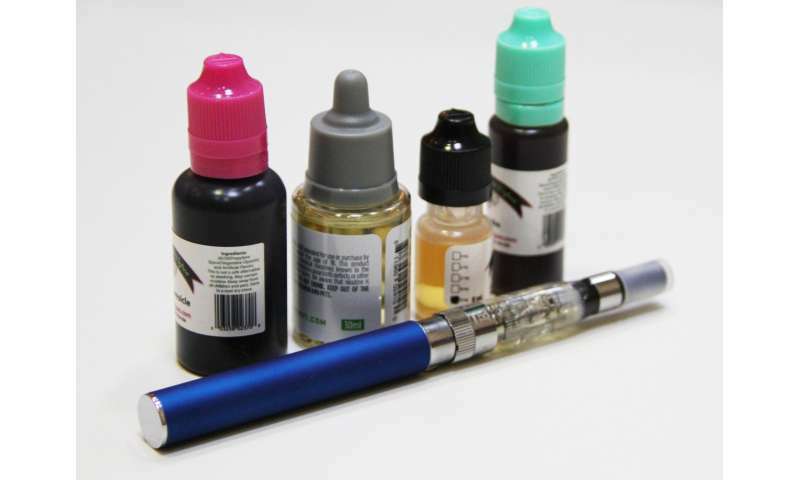 Increased concern about the risks of liquid nicotine exposures led to state and federal legislation requiring child-resistant packaging for liquid nicotine containers in recent years. The annual rate of exposure to liquid nicotine and e-cigarettes increased by almost 1400% from 2012 to 2015 and then decreased by about 20% from 2015 to 2016. The observed decline in exposures since January 2015 may, in part, be attributable to legislation requiring child-resistant packaging and greater public awareness of the dangers of e-cigarette products to young children. "Although the observed decrease in exposures is encouraging, the number of young children still being exposed to liquid nicotine is unacceptably high," said Gary Smith, MD, DrPH, senior author of the study and director of the Center for Injury Research and Policy at Nationwide Children's Hospital. "Additional regulation is needed." The authors recommend adding flow restrictors to liquid nicotine refill bottles, similar to those used for children's fever medications, to limit young children's ability to empty the contents of the bottles, and child-resistant chambers on e-cigarette devices to help prevent liquid nicotine exposure to young children. Additionally, the volume and concentration of liquid nicotine in refill bottles should be limited to a sub-lethal dose for an average young child. This approach has been used for decades for products like children's aspirin. To decrease exposure among young children, the authors also call on the US Food and Drug Administration to prohibit the use of flavors and attractive labeling for liquid nicotine as was done for cigarettes. Store e-cigarettes and refill products where children cannot see or reach them like you would for other poisons - in a locked location is best. Do not store them in a purse, which children can easily access. Use and refill alone. Do not use e-cigarettes around children. Because children want to imitate adults, using e-cigarettes and refilling them with children nearby could lead to a dangerous exposure. The images, smells, and colors may attract children. Refill, clean, and dispose of products safely. Wear rubber or latex gloves when handling liquid nicotine. Clean up spills right away with paper towels. Get rid of leftover liquid by pouring it into a bag of kitty litter or coffee grounds. Put empty liquid nicotine containers, papers towels, and any other waste into the bag, and throw it away in a trash can kids can't open. Once everything is in the trash, wash your hands. Adults in households with children younger than 6 years old should be counseled on vaping cessation. If adults with young children continue to use e-cigarettes, they are strongly encouraged not to use or store e-cigarettes, liquid nicotine, and related products in the home. Data for this study were obtained from the National Poison Data System, which is maintained by the American Association of Poison Control Centers (AAPCC). The AAPCC receives data on calls to participating poison centers that serve the US and its territories. Poison centers receive phone calls through the Poison Help Line and document information about the product, route of exposure, individual exposed, exposure scenario, and other data.